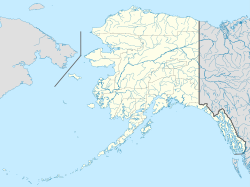 Kotlik (Qerrulliik in Central Yup'ik) is a city in Kusilvak Census Area, Alaska, United States. At the 2010 census the population was 577, down from 591 in 2000. The Yupik village of Bill Moore's Slough is contained within Kotlik. Kotlik first appeared on the 1880 U.S. Census as an unincorporated Inuit village of 8 residents. In 1890, it reported 31 residents, of which 9 were native (presumably Inuit) and 22 were "Creole" (mixed Native and Russian). It did not report again on the census until 1920. It formally incorporated as a city in 1970. There were 117 households out of which 70.1% had children under the age of 18 living with them, 65.0% were married couples living together, 11.1% had a female householder with no husband present, and 12.8% were non-families. 10.3% of all households were made up of individuals and 3.4% had someone living alone who was 65 years of age or older. The average household size was 5.05 and the average family size was 5.48. In the city, the age distribution of the population shows 48.2% under the age of 18, 11.2% from 18 to 24, 24.9% from 25 to 44, 12.0% from 45 to 64, and 3.7% who were 65 years of age or older. The median age was 18 years. For every 100 females, there were 114.1 males. For every 100 females age 18 and over, there were 109.6 males. The median income for a household in the city was $37,750, and the median income for a family was $37,969. Males had a median income of $29,583 versus $16,875 for females. The per capita income for the city was $7,707. About 18.4% of families and 21.1% of the population were below the poverty line, including 21.8% of those under age 18 and 25.9% of those age 65 or over. ^ 1996 Alaska Municipal Officials Directory. Juneau: Alaska Municipal League/Alaska Department of Community and Regional Affairs. January 1996. p. 85. ^ "Annual Estimates of the Population for Incorporated Places in Alaska". United States Census Bureau. 2008-07-10. Archived from the original on 2008-09-12. Retrieved 2008-07-14. This page was last edited on 31 January 2019, at 12:29 (UTC).